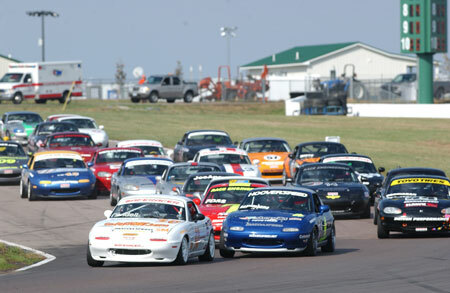 The SCCA Club Racing program is the road racing division. Drivers race wheel-to-wheel on either dedicated race tracks or on temporary street circuits. The St. Louis region’s official track is Gateway International Raceway. Competitors require either a regional or a national racing license. Both modified production cars (ranging from lightly-modified cars with only extra safety equipment to heavily-modified cars that retain only the basic shape of the original vehicle) and purpose built formula or sports racer cars can be used in club racing. Most of the participants in the Club Racing program are unpaid amateurs, but some go on to professional racing careers. The club is also the source for race workers in all specialties, without whom racing organization and operation would not be possible. Several sanctioning bodies, including IMSA, Indycar and the FIA, rely on SCCA volunteers for corner workers at professional road racing events. The annual national championship for SCCA Club Racing is called the “Runoffs” which was held at Mid-Ohio Sports Car Course from 1994 through 2005. In 2006, the Runoffs moved to Heartland Park Topeka. Beginning in 2009 the Runoffs will be held at Road America in Elkhart Lake, Wisconsin for a minimum of three years. The Solo program is the SCCA autocross program. One car runs at a time, on a course laid out with traffic cones on a large paved surface, such as a parking lot or airport runway. Competitions are held at regional, divisional, national, and pro levels. Each division typically crowns a Divisional Champion in each class, awarded by winning a single event. Similarly, a National Champion in each class is awarded by winning the class at the National Championship (usually referred to as “Nationals”) held in September. Since 2006 The Solo National Championship has been held at recently renovated Heartland Park Topeka in Topeka, Kansas. In 2009, Nationals will be moving once again to the Lincoln Airpark, in Lincoln, NE. Individual National-level events, called “National Tours”, are held throughout the racing season. The professional autocross series, called ProSolo, runs two cars at a time on mirror-image courses and features a drag racing style “Christmas tree” start, complete with reaction times and 60′ times. Class winners and other qualifiers (based on time differential against the class winner) then compete in a handicapped elimination round called the “Challenge”. Points are awarded both in class competition and in Challenge competition, and an annual champion is crowned each September at the Pro Finale event in Topeka, Kansas. For a getting started guide, information on upcoming events, and much more, visit the St. Louis Region Solo Program website. PDE, or Performance Driving Experience, are non-competitive and provides an instructional environment for drivers to practice performance driving and car handling. A true “run what you brung” event, many drivers use Track Events as an opportunity to drive their street car on a race track – without the pesky speed limits you find on city streets. Novice drivers are assigned instructors, and can move up to more advanced groups during the track day or over several track days. St. Louis Region Track Events events are held on the road course at Gateway International Raceway. Multiple cars are allowed on track at once, but in contrast to club racing, there is no passing or wheel-to-wheel racing. RallyCross, also known as RallyX, is a timed event that involves solo driving on grass or dirt and is often considered “autocross on the dirt.” As with autocross, the emphasis is on driver skill and handling rather than absolute speed, with frequent corners generally keeping speeds below 60 mph (100 km/h). In many ways RallyCross is to rally racing as autocross is to road racing. RallyCross is the most widespread and readily accessible form of extreme dirt motorsport in the Sports Car Club of America. Entry fees and equipment requirements are considerably less than those necessary to enter any other forms of performance rally, so in most locations one need only arrive at event registration with a sound, hardtop vehicle and the entry fee. Road rallies are run on open, public roads. These are not races in the sense of speed (obviously, speed limits are to be obeyed), but of precision and navigation. The object is to drive on time, arriving at checkpoints with the proper amount of elapsed time from the previous checkpoint. Competitors do not know where the checkpoints are.